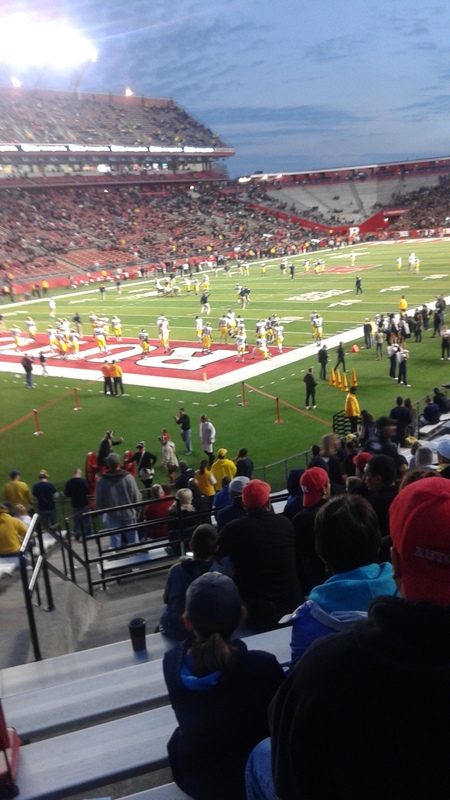 Something interesting happened at the Michigan-Rutgers game Saturday night. No, not Michigan’s loss. Those are becoming routine. No, not that Michigan put 10 men out on a special-teams play, again. No not that Michigan mismanaged the clock, again. You get the picture. No, this interesting thing happened before the game. We had settled into our seats and were waiting for the game to start. Ryan had his headphones in and was listening to music to “get fired up for the game.” Music, first from his iPod, and now transferred to his phone, is a comfort mechanism. More than anything, it allows him to easily pass the time when he has to wait for anything — something that was never easy before. So listening to music was not the interesting part. Ryan was listening on his phone because he got a new smart(ish) phone for school this year. He said he wanted one because all his friends had phones that could surf the internet. He was using an old hand-me-down (dumb) phone and this was the first time he expressed interest in wanting something different. We agreed, and got him a very basic smart phone. He uses it to text, and listen to music, and check scores, and look at NHL stats when he wants. Like music, that helps him pass the time more easily, whereas he used to get very agitated when he had to wait. We saw this on the post-game bus ride Saturday night. But a few minutes before kickoff, Ryan found a very different use for his phone. He pulled it out, found the camera app, and took a few photos of the field. He asked me for help, because I’m pretty sure this was his first time using this, or any other, camera. It got me to thinking. I have read various criticisms of how our digital photo and video and selfie-obsessed culture leads to all of us witnessing significant events through tiny viewfinders or our phone screens, and not in the wondrous, super-HD, widescreen view that our eyes offer. This has never been the case with Ryan, who has never expressed a desire for photo keepsakes of important memories. I treasure some of those shots — of him skating at the Winter Classic, or meeting his favorite San Jose Sharks, but he rarely expresses interest in looking at the pictures. Maybe there’s a reason for that. I talk often of Ryan’s “photographic” memory. His recall of statistics, dates, long-ago conversations, and all manner of data can be astounding. Maybe that extends to his visual recall? Could it be that he never cares about pictures because he recalls significant events in the same level of visual detail? I don’t know. I just know that I found it very interesting that he was taking photos because it was such a rare event. Maybe I’m reading too much into this. Maybe he saw others taking pictures on their phones and decided to do the same. I don’t know if he ever even looked at the pictures — most of which were taken with such haste that they were completely out of focus. There is only one time that I can recall him caring about looking at pictures, and that was of one of our sports outings, so maybe my theory is all wrong. But maybe I am on to something. Maybe he doesn’t take pictures because he doesn’t need to take pictures. So why take them Saturday night? With their ability to be instantly communicated, pictures today are a social medium. Ryan desired a better phone in part for social reasons. Maybe he was thinking beyond his own memories, and wanted pictures from the game to share? I don’t know. I could be completely off base with all of this, but any time my routine-oriented son does something radically different, there’s usually a reason. If there doesn’t seem to be one, it’s usually because we haven’t been able to figure it out yet. So I’ll continue to wonder about these pictures, all part of trying to figure out how my son experiences life, and how that differs from the way I do. I’ll tell you one thing that I have learned to be true. No matter how his experience may differ, it is most definitely not less, just different. And quite possibly better. I haven’t commented in a while, but do still read. I just have to say that reading about the UM losses is so, so sad. But keep your head up and hang in there. That’s what true fans do…and I know you are a true fan.